Cook the slices of aubergine on the grill with a little olive oil until soft. Set aside to cool. Cut the manouri into sticks (approx. 5×1.5cm). 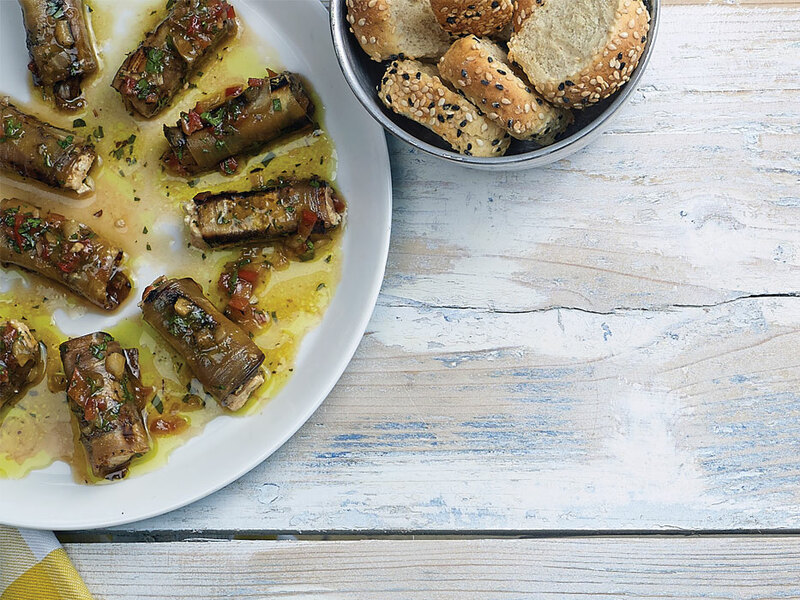 Roll it with slices of aubergine and place in a baking tin. In a bowl, whisk the olive oil and vinegar together, then add peppers,onion, garlic, parsley, tomato, salt and pepper and mix well. Pour the mixture over the rolls and refrigerate for 6-8 hours. Remove rolls from refrigerator and wait until they reach room temperature. Serve with a little marinade. Any rolls left over should be kept refrigerated.